The Inspiron™ 570 desktop is everything you want and nothing you don’t. Plus, you can build your desktop according to your needs with a choice of multiple AMD® processors and NVIDIA® ATI graphics cards* as well as other customizable features. So whether you are surfing the Web, emailing friends and family, downloading music and photos or blogging about it all, the Inspiron 570 desktop can handle it. 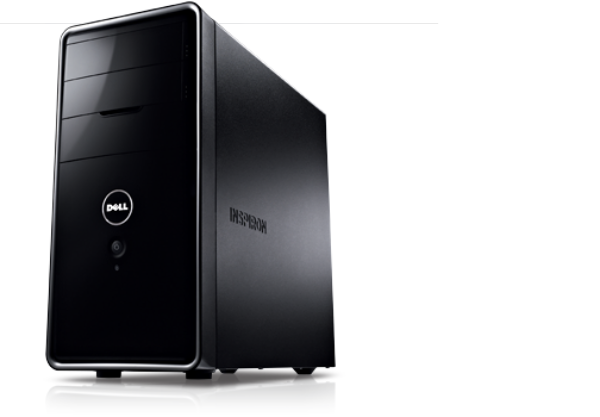 The Inspiron 570 desktop is optimized to provide the entertainment features you need for a price you want. It features VISION Technology from AMD, which allows you to experience vivid Web and video content, sharp photos and crystal-clear music. Watch your screen come to life with the Integrated ATI Radeon™ HD4200 Graphics* and with optional NVIDIA® and ATI™ discrete graphics* cards to maximize your viewing experience. Immerse yourself into a cinematic experience by connecting to a HD monitor or TV with the HDMI™ port. Plus, watch your favorite hi-def movies with the optional Blu-ray Disc™ drive. See it, love it, save it. Store your favorite music, photos and video using a single hard drive with up to 1TB of storage. Chassis expandable to support second hard drive. Quickly transfer your digital photos and music from your digital camera with the 19-in-1 media card reader. With the Inspiron 570 desktop, you can have the power as you want. Meet your performance needs with a choice of powerful AMD processors. The AMD Sempron™ is designed to get you through your day-to-day computing and beyond. Be prepared for today and tomorrow with the AMD Athlon™ processor that provides superior performance in an ever-changing world of technology. Or live your life in Hi-def with the AMD Phenom™ processor for Hi-def entertainment, gaming, creativity and beyond. And with up to 8GB* dual channel DDR3 memory* you can zoom along without hesitation.